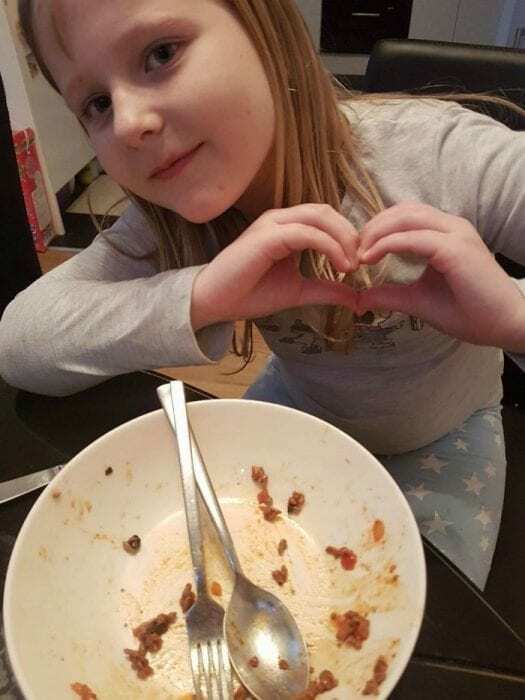 Pasta is an absolute staple in our house, both Mini Me and I cannot get enough of it! 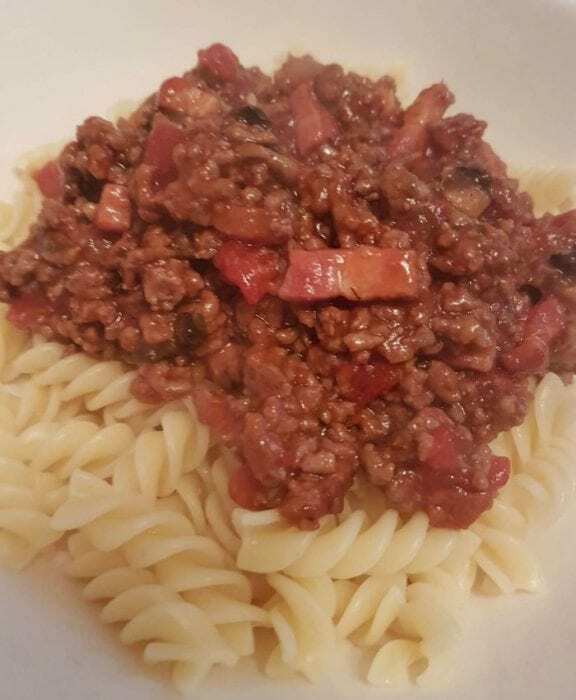 It really is one of those meals which is super comforting, super quick to make and you can throw anything in it and know it will still taste fabulous. 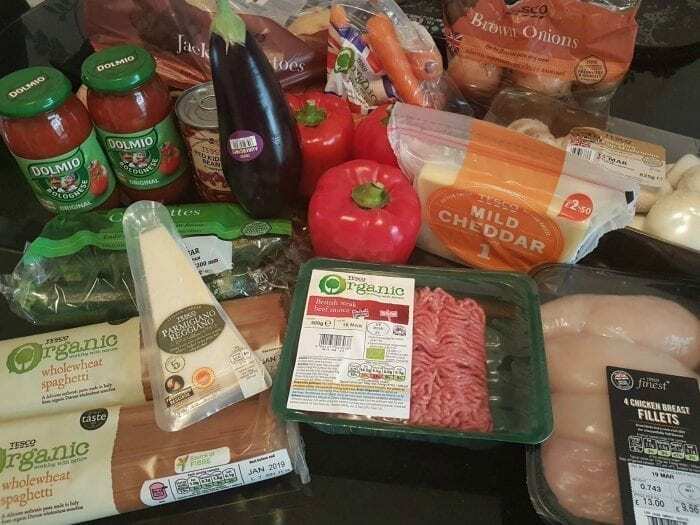 We were lucky enough to take part in the Britmums #Dolmio #ThankGoodness campaign to highlight how awesome Dolmio is and how easy it is to make a quick, nutritious and totally delicious mid week meal that all the family can enjoy. This meant we received a Tesco delivery of goodies to make a meal or two with the Dolmio sauce and see how we got on. Well, for us it really did turn up at the right time – both Mini Me and I were housebound due to chicken pox and the fridge was running particularly low. 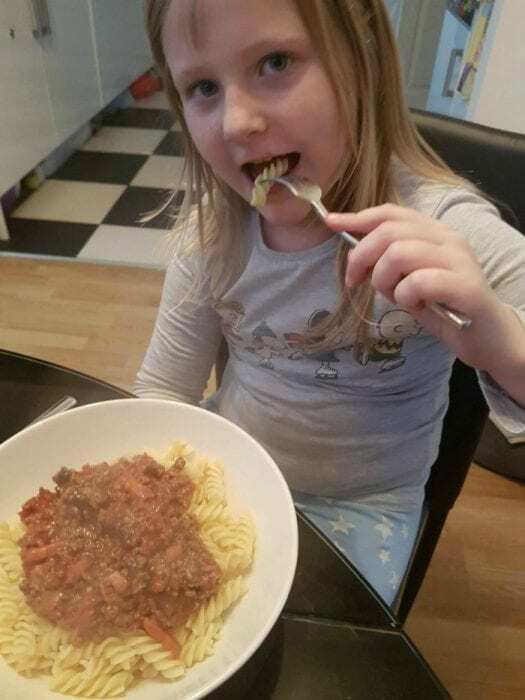 We had all the ingredients to make Spaghetti Bolognese with the Dolmio Bolognese sauce, yet in actual fact instead of using the Spaghetti, I used Mini Me’s favourite Fruslli pasta. 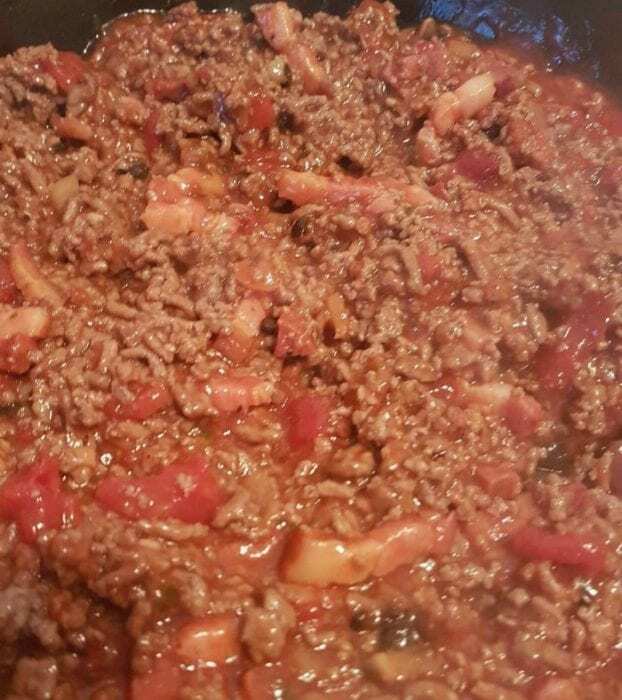 I love to allow the meat and sauce to marinate for a while to allow all the different flavours to combine and after cooking the mince this is what I did. 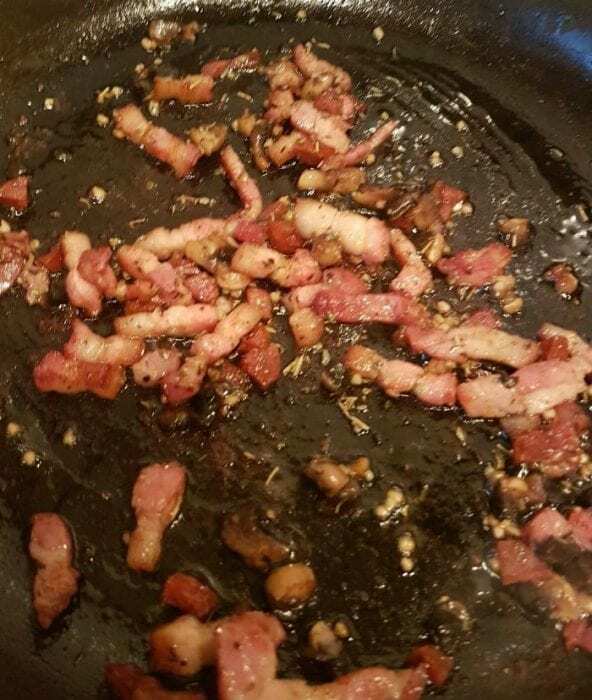 Whilst cooking the mince, a separate pan was used to cook some bacon lardons, chorizo, garlic, mushrooms and then the Dolmio sauce was added. The aroma that emanated throughout the house was sublime and with a friend over to keep Mini Me company, all I could hear were comments about how nice it smelled. I do love a pasta dish with bacon lardons and chorizo, for me you could add salami, chicken etc and really make a hearty dish. Not knowing how the children would cope with the dish as it was, I felt playing it safe was the right move… and didn’t let them know it contained mushrooms! After serving up, I left the girls to it to natter away and eat at their own leisure… being on a shake diet really does become annoying on occasion! However all I could hear were comments about how lovely it was and then silence as they chomped down on their Dolmio pasta dish. An absolute success with near empty bowls at the end and Mini Me asking to have that meal again in the future. Frankly, as a single mum Dolmio isn’t something I would generally put in my trolley. At £3 for 2 jars in the current Tesco price promotion, it really is at the expensive end of my budget. However, can you really put a price on your child eating a ridiculously hearty and healthy meal and asking for it again in the future? 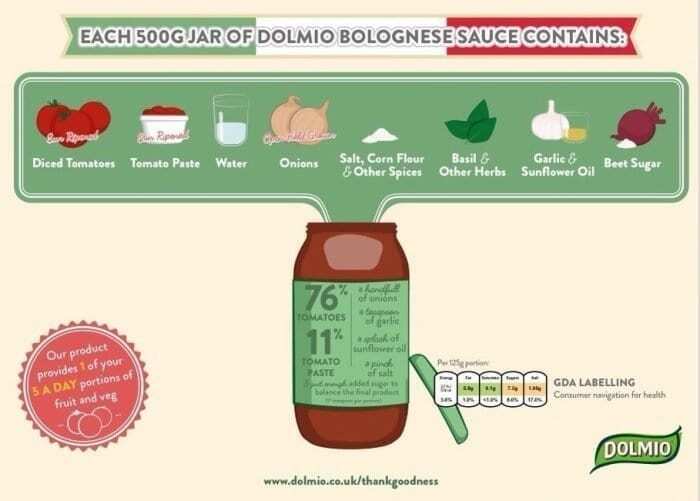 Dolmio Bolognese sauce contains no artificial colours, flavours, preservatives or sweeteners, which is very reassuring. A 500g jar of the Bolognese sauce is totally 100% natural. 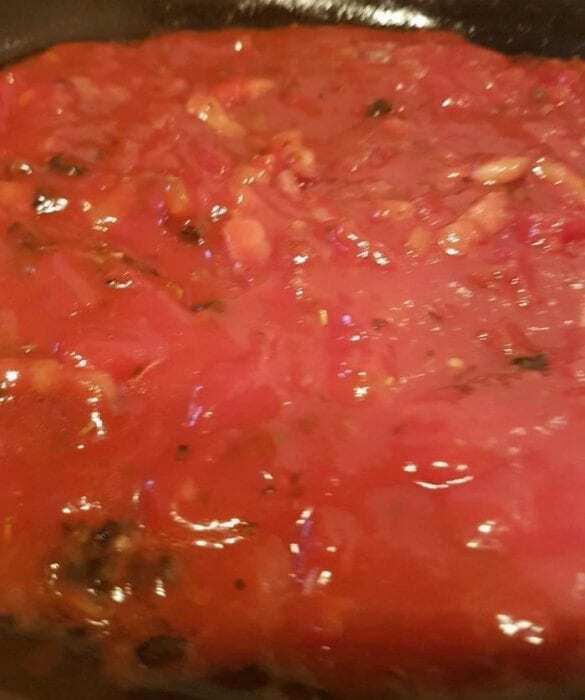 You’ll probably be surprised to that the ingredients include at least 10 juicy diced tomatoes, a dollop of tomato puree, half an onion, a tablespoon of sunflower oil, a couple of cloves of garlic, a handful of herbs including basil, a teaspoon of cornflour, a teaspoon of salt, a pinch of pepper, two teaspoons of added beet sugar for taste, a squeeze of lemon juice, a splash of water and nothing more. A jar helps to provide a family of four with one of their 5-a-day each and that’s before you add any further veg to the meal, which we didn’t really on this occasion… more meat than anything! Not wanting the rest of the glorious food delivery to go to waste, I looked for recipes for healthy meals that I could eat once off my diet. 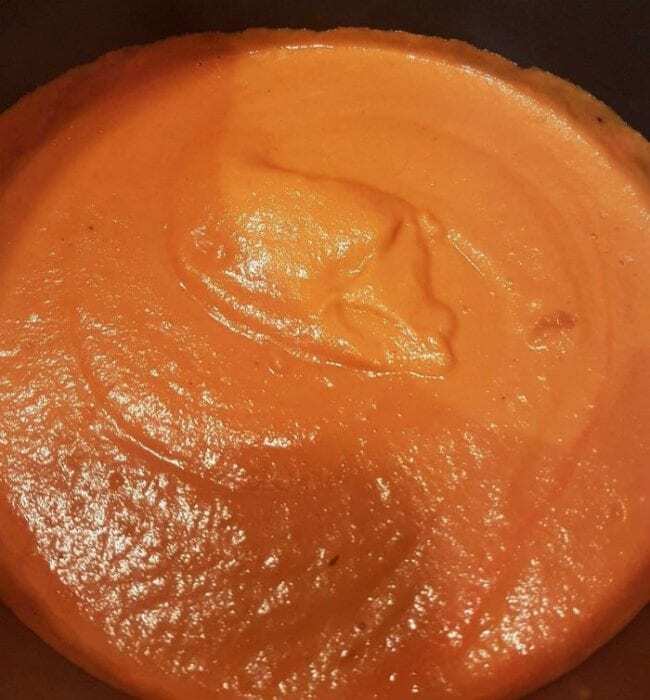 A fan of soup, but never actually having made any, I thought that a carrot and roasted red pepper recipe would be the best way to go! With the red peppers roasting for 30 mins, I combined 8 carrots with 1 onion, a clove of garlic, a touch of dried coriander in a pan on the hob and waited to transfer over the peppers when ready. I’m not a fan of cooking with salt so added a sprinkle of pepper and 800ml of beef stock – don’t ask, it should have been vegetable – and then simmered all the ingredients for a further 35 mins. 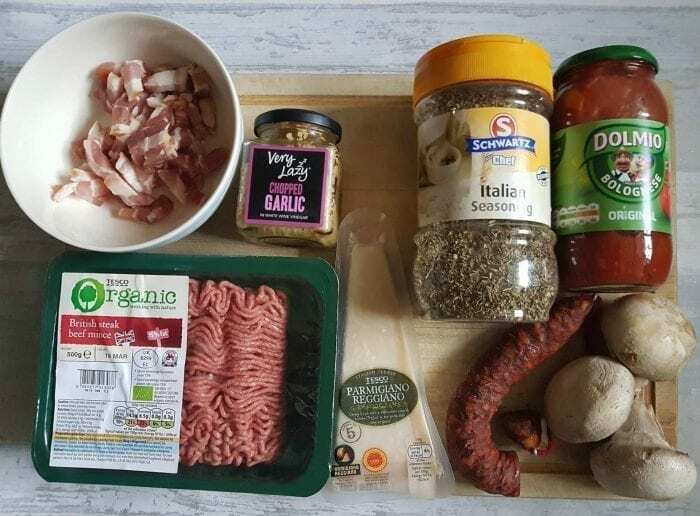 The result after blending was amazing and the aroma absolutely divine, without taking part in the #Dolmio #Thankgoodness campaign, I would never have made the soup and realised how easy it is to actually make! It actually makes a perfect starter before eating a Dolmio Bolognese pasta dish and I shall definitely be making it again very soon. If you would like further information about the Dolmio brand visit www.dolmio.co.uk/thankgoodness or if you’re looking for mid-week meal inspiration check out the label on Dolmio jars. Tempting stuff! Commenting for myself and on behalf of BritMums and thanking you for taking part.